Roberts retired three first three Reds batters of the game on a strikeout and two groundouts. The bottom of the first featured scratch hits by Richie Ashburn and Granny Hamner. Ashburn opened the Phillies' offensive attack with a grounder to short. Virgil Stallcup knocked it down but Ashburn beat the throw. Hamner hit a ball that Blackwell also knocked down, but Hamner reached. Blackwell walked Eddie Waitkus to load the bases with no outs. 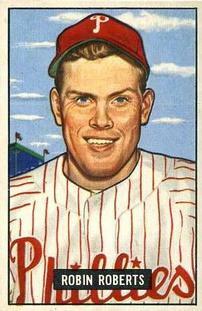 The Phillies’ cleanup hitter, Del Ennis, hit a groundball to Stallcup at short, who started a 6-4-3 double play. Ashburn scored as the Reds traded the run for two outs. Willie Jones grounded out to third to end the inning, but the damage was done. That lone run was all right-hander Roberts would need. Ron Northey led off the Reds’ second with a double to right field. Roberts stranded him there, retiring Joe Adcock, Connie Ryan, and Stallcup on a fly ball to right and two groundouts. In the bottom of the third, Ashburn walked with one out, stole second, and moved to third on a groundout, but Blackwell stranded him there, getting Waitkus to fly out to center field. Roberts allowed a two-out single to Northey in the fourth inning, but Adcock flied out to right to end the threat. In the eighth inning, Cincinnati catcher Dixie Howell walked, bringing Blackwell to the plate. Herm Wehmeier ran for Howell, and Blackwell successfully bunted him to second. Grady Hatton grounded to the right side, moving Wehmeier to third. Roberts then “bore down again and Wehmeier, running for Howell, died at midway,”6 as Lloyd Merriman flied out to left fielder Sisler to retired the side. Philadelphia got two runners aboard on walks in the bottom of the inning, but nothing came of it, as Blackwell struck out two and got a fly out. Roberts retired three straight in the ninth on two groundballs and a popout to preserve the 1-0 victory. Phillies manager Eddie Sawyer described the pitching duel: “They call it the rabbit ball, but when a couple of pitchers like Roberts and Blackwell work there is about as much rabbit in the ball as there is in a rock. The hardest-hit ball of the night was Connie Ryan’s foul.”7 He was referring to Ryan’s foul ball hit in the seventh inning. Ryan sent a Roberts offering deep into the left-field seats, but about two feet foul. The Cincinnati Times-Star reported that this was “Blackie’s best game in three years.”8 However, as The Sporting News reported, “Roberts proved invincible in posting (the) shutout.”9 None of Philadelphia’s hits off of Blackwell were struck hard, but it didn’t matter. Roberts was simply brilliant. He gave up two hits, both by Ron Northey, and only one runner reached third base. It was Roberts’s sixth complete game of the season (in seven starts) and his earned-run average dipped to 1.95. In addition to the sources mentioned in the notes, the author consulted baseball-reference.com and retrosheet.org. The author would like to thank Holly A. Jackson, reference librarian at the Public Library of Cincinnati and Hamilton County, for her assistance in providing documents from Cincinnati newspapers. 1 “Blackwell Loses Brilliant Mound Duel to Roberts, 1-0,” Cincinnati Enquirer, May 17, 1950. 2 Cincinnati’s Blackwell stood 6-feet-6 and had a nasty side-arm delivery, hence his nickname. He was named to the National League All-Star squad every season from 1946 to 1951. In 1950 he was 27 years old. He finished the 1950 season with 17 victories and 15 defeats. Blackwell suffered from health and arm problems through much of his career and was out of the major leagues by the age of 32. 4 “Phils Score Winning Run in First Frame on Double Play,” Cincinnati Times-Star, May 17, 1950. 5 “Phils Hold Lead by Shading Redlegs, 1 to 0,” Cincinnati Post, May 17, 1950. Ryan did not play again for 10 days. 6 The Sporting News, May 24, 1950. 10 Robin Roberts and C. Paul Rogers III, The Whiz Kids and the 1950 Pennant (Philadelphia: Temple University Press, 1996), 225.